RUSH: Look at this. Let's see. Da-da-da-da. More than 41% of New Yorkers say they can't afford to live in the city and they plan to leave, and then there is an accompanying list of the fastest shrinking cities in the country. And you know what's happening here. A bunch of people are fleeing cities that they have participated in creating, the political circumstances. They've voted for a bunch of libs, raised taxes and choked off economic growth. They've raised real estate prices. And now they say they gotta leave, and they leave, and they go to other states -- presumably no-income-tax states -- and they bring with them the same destructive political ideas and they start electing the same people that destroyed the places that they're leaving. 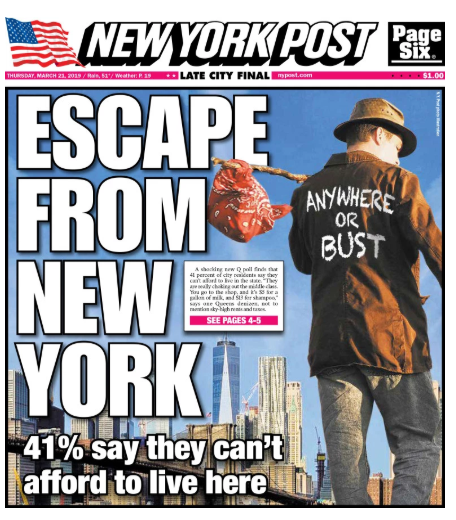 Forty-one percent say they can't afford to live in New York City and plan to leave. It's probably not that high that will actually move out of there, but what if it was?